Adventurers rejoic, CAT has beaten Samsung in the race to launch the world's first rugged Android KitKat smartphone. 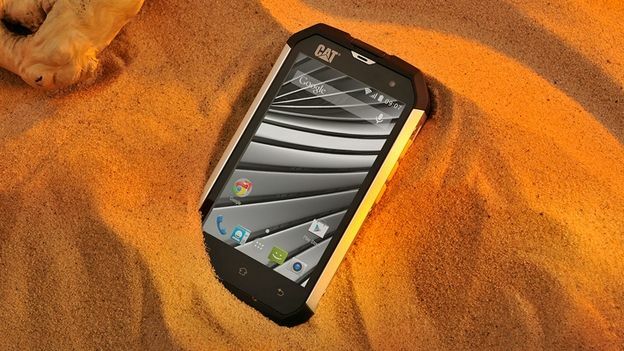 Though better known for making diggers, CAT does have a range of rugged Android-based smartphone. The B15Q is the latest in the range to be launched, and comes with Android KitKat as standard. Samsung, purveyor-of-all, is poised to unveil its own rugged Android smartphone in the coming weeks in the guise of the Samsung Galaxy S5 Active. However, if the two smartphones were to square up to a fight, our money would be on CAT's phone, no questions asked. That's because it takes the concept of a rugged smartphone to a whole new level. Indeed, the phone is so tough it has achieved the IP67+ MIL SPEC 810G durability rating. That's just what it sounds like – it's tough enough to be taken into the battlefield. It's basically like the Jack Reacher of smartphones. CAT's B15Q is dust proof, scratch resistant and can withstand temperatures between –25ºC to +55ºC. Inside, the B15Q is powered by a 1.4GHz quad-core Media Tek processor, with 1GB RAM, Bluetooth 4.0, 3G, a five megapixel rear facing camera and a microSD slot for up to 64GB of expandable storage. Okay, so that might not sound all that impressive, but bear in mind that sacrifice means CAT has been able to squeeze 19 days on standby out of its 2,00mAh battery. It also comes with a four-inch touchscreen with a resolution of 480 x 800. Again, that doesn't sound impressive, but it can track your fingers when wet. So, y'know, glass is half full and all that. The CAT B15Q will arrive in the UK early next month for £299.